From historic townhouses in Philadelphia to 18th century farms in Lancaster County to country estates in the Laurel Highlands, Pennsylvania is filled with interesting bed and breakfast locations for you to stay during your visit. Staying in a bed and breakfast allows you to not only enjoy the surrounding area, but also to relax after a long day sightseeing in a cozy, home-like atmosphere. You can enjoy the exciting city life of Philadelphia and its historical attractions or relax in Amish country while shopping at local stores for one-of-a-kind crafts while in the Eastern part of Pennsylvania. 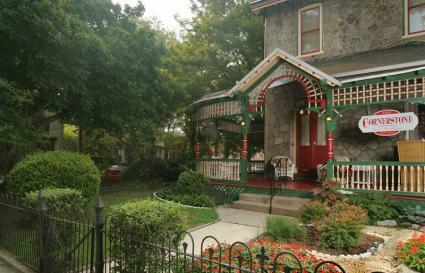 Cornerstone Bed and Breakfast: Located in Philadelphia, this restored 1865 Victorian mansion is close to attractions such as the University of Pennsylvania, Drexel University and the Philadelphia Museum of Art. It features a complimentary breakfast and offers guests free WiFi, making the best of both modern amenities and old-world charm. Fairville Inn: Located in Chadds Ford, this inn is situated in the heart of Brandywine Valley. It is close to the business district of Wilmington, Delaware and is near the rail line to Philadelphia. It features elegant rooms all with a complimentary full breakfast each day. Longwood Gardens and Winterthur are attractions within five miles of the inn. 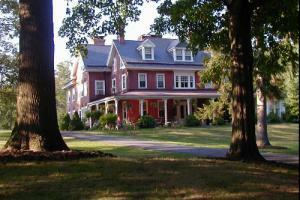 Foxcreeks Farm Bed and Breakfast: Located in Kennett Square, this b&b is in the scenic area of Chester County. The spacious guest rooms all have garden views and guests have access to a swimming pool on the grounds. A complimentary home-cooked breakfast is included with each stay. 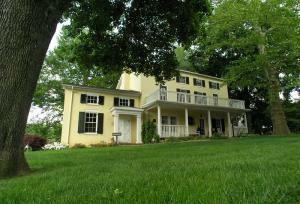 This property is close to many wineries and vineyards as well as the Brandywine Battlefield. Flowers and Thyme Bed and Breakfast: Located in Lancaster, this charming B&B was built in 1941 and is nestled in the countryside, just minutes away from antique and outlet shopping, farmers' markets, and Amish country. Rooms are furnished with antiques, cross-stitched samplers, and handmade quilts. Guests have their choice of a canopy bed, an electric fireplace, or a Jacuzzi tub. A full breakfast is served each morning, overlooking the inn's manicured gardens. 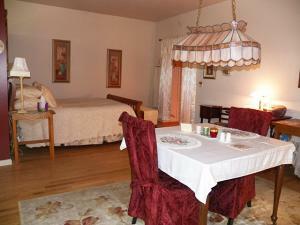 Cameron Estate Inn: Located in Mount Joy, this inn is close to both Amish and Mennonite farms. The inn's atmosphere is cozy and romantic making it ideal for honeymoons or vacations. While at the inn, guests can enjoy dining at the five-star restaurant, staying in a room with a Jacuzzi and fireplace and taking in the scenic grounds. A complimentary daily hot breakfast is included with each stay. The Inn on Negley: Located in Pittsburgh's Shadyside neighborhood, this inn is close to shopping, dining and much of the city's entertainment. Guests can enjoy a relaxed atmosphere, complimentary refreshments and amenities such as wireless internet, in-room Bose radios and comfortable robes and slippers. Morning Glory Inn: Located in Pittsburgh's South Side, this inn features a mix of old and new styling and offers complimentary breakfast each day of your stay. The three-story townhome has rooms with fireplaces. Some have views of the city and others overlook the courtyard. The surrounding neighborhood has local shops, bars and several restaurants. Campbell House Bed and Breakfast: Located in Ligonier, this b&b offers old-fashion charm and modern amenities such as flat screen televisions, air conditioning and WiFi. It is nestled among quaint shops and local galleries. Many rooms have fireplaces and are uniquely decorated. Quill Haven Inn: Located in Somerset, this inn has both single and double rooms all with private baths, wireless internet and heated mattress pads. The inn features an outdoor hot tub on a private deck, a fireplace in the common room and full breakfast for each guest. Ski and restaurant discounts are offered to guests staying at Quill Haven. It doesn't matter what part of Pennsylvania you plan to visit since you are sure to find a great place to stay and relax. There are many inns in the state that offer modern amenities, historical charm and plenty of opportunities for pampering to help you escape from a busy day and get away from it all.